Syria: Assad 'must be more responsible' Jump to media player US Secretary of State John Kerry says Syrian President Bashar al-Assad needs to be more responsible for a truce to work. Aleppo family living in a cemetery Jump to media player A woman explains how her family has come to live in these conditions in the besieged city. Helping Syrian children understand war Jump to media player Helping children in Syria understand why life is so hard. 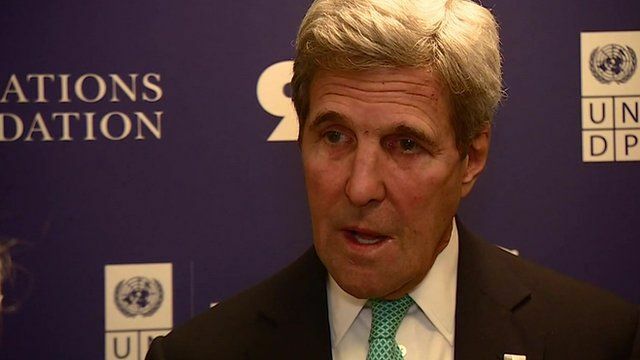 US Secretary of State John Kerry has told the BBC that Russia needs to be more serious about getting the Syrian government to abide by the terms of the ceasefire. Six days after the start of a fragile truce, air strikes are reported to have targeted anti-government groups in Aleppo. The deal, agreed by the United States and Russia, is also being threatened by tensions over a US-backed strike that killed more than 60 Syrian troops. Speaking with the BBC's Katty Kay, Mr Kerry was asked to what extent the US military would be responsible if the ceasefire did not hold.